This site contains free materials for learning to speak Kunwinjku, the main dialect of Kunwok that is spoken in Gunbalanya. 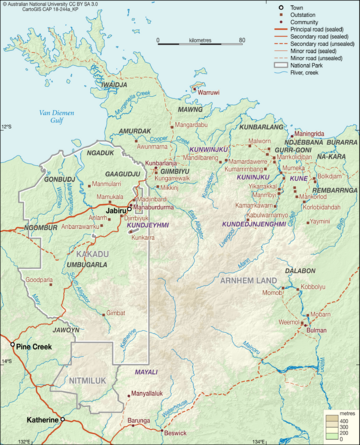 Closely related dialects are spoken in Jabiru and Maningrida, and further south in Bulman and Pine Creek. These materials have been created by learners for learners, especially for anyone who comes into regular contact with Bininj, the speakers of Kunwok. Contribute: To post comments on these wiki pages, please sign up for an account using the link at the top right. To contribute to this site please email Steven Bird. The head image is from a painting by Gavin Namarnyilk, used with permission. The materials on this site have been compiled by Bangardi Steven Bird with contributions from Ngalkodjok Alexandra Marley and Bulanj Dean Yibarbuk. This page was last edited on 7 March 2019, at 07:04.